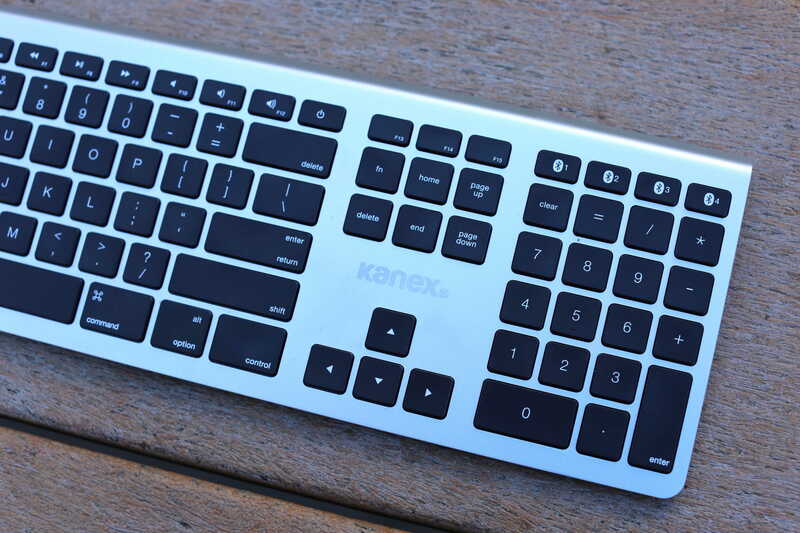 Kanex's MultiSync wireless aluminum Mac keyboard with one-touch quick switching. If the Apple Magic Keyboard is like the latest MacBook — sleek, svelte and missing key features due to Cupertino’s maniacal pursuit of those first two attributes — the Kanex MultiSync Aluminum Keyboard is akin to a MacBook Pro. It looks and feels a lot like Apple’s stock wireless keyboard, but adds functionality that will make the Kanex an ideal solution for some power users. Made of Apple’s favorite metal, the Kanex MultiSync Aluminum Keyboard looks just as lean as the Magic Keyboard, but it comes with badass black keys reminiscent of a MacBook. The silver-and-black look matches the latest iMac better than the Magic Keyboard does, too, and the dark keys won’t get filthy the way the white ones will on Apple’s effete input device. The Kanex (pronounced “connects”) keyboard also packs the holy grail of number crunchers everywhere: a 10-key number pad. Apple sells a wired keyboard that comes with a number pad, but no wireless model includes this option. Apparently, Jony Ive and his austerity-obsessed design team don’t think you need one. Kanex is here to offer a corrective. And then there’s connectivity. As befitting its name, the Kanex MultiSync connects via Bluetooth to up to four devices. Why would you need this feature? If you’re reading Cult of Mac, you likely live in the Apple ecosystem. If you’ve ever wanted to situate yourself in the middle of a true Cupertino cockpit, the MultiSync might be your best option: Circle yourself with a Mac, an iPad, an iPhone, an Apple TV or any combination of those four devices, and all of them can be paired with the Kanex keyboard and then controlled. You switch seamlessly between devices using a line of four Bluetooth buttons atop the MultiSync’s number pad. Some people love the short travel of Apple’s keyboards; the Kanex feels very much like Cupertino’s offerings, although the MultiSync’s ever-so-slightly larger keys somehow make it feel a little less cramped. For me, the Kanex works for casual typing. But when I have to pound on it all day, it makes my fingers hurt. I much prefer the weird-looking (and filthy) Goldtouch ergonomic keyboard I’ve been using for years. Split in the middle, and adjustable both vertically and horizontally, the Goldtouch eases the RSI that can leave my fingers and wrists aching after a long day of typing. However, when one of my colleagues sits down and tries to use the Goldtouch, they go mad. It’s clearly not for everyone. The Kanex, on the other hand, is totally approachable. 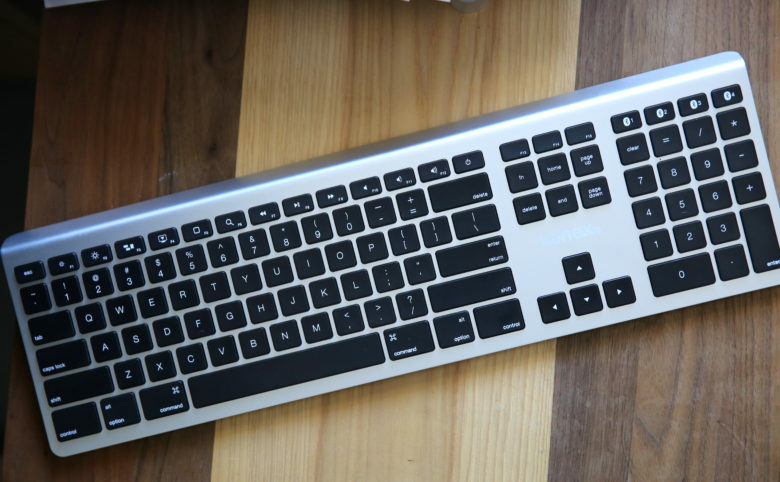 Kanex’s MultiSync wireless aluminum Mac keyboard with sleek low-level design and premium aluminum. What doesn’t the Kanex MultiSync Aluminum Keyboard have? For one, the keys aren’t backlit, which can be a major drag, especially if you’re a night owl. The Magic Keyboard isn’t backlit either, but this seems like a major missed opportunity for Kanex to one-up Cupertino once again. The Kanex keyboard also uses standard AAA batteries, which isn’t the greatest for the environment. You can use rechargeable AAAs, but a built-in battery that charged by Lightning cable would be even better. On this front, the Magic Keyboard’s Lightning-rechargeable design dominates. Is a Kanex keyboard for you? So, is the Kanex MultiSync Aluminum Keyboard for you? When compared to the Apple Magic Keyboard, it seems like a smart choice. They cost the same and, unless you’re planning on traveling with the keyboard or can’t bear AAA batteries, there’s almost no way the Apple device comes out on top in a head-to-head comparison. But then there’s that intensely personal aspect of how the keyboard feels to you. If you’re a monster typist and don’t like the way Kanex’s low-profile keys feel under your fingers, no nifty features will make up for that. My best guess is that if you’ve tried an Apple wireless keyboard and were OK with that, you should be fine with the Kanex. If that’s the case and you need a number pad, want the ability to quickly switch between multiple devices, or simply find yourself drawn to the Kanex’s awesome obsidian keys, the MultiSync Aluminum Keyboard is a no-brainer.